New England Wood Chatham Bedroom Armoires for wardrobe storage, bed linens and more. 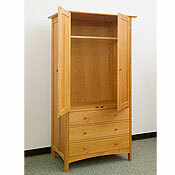 Includes 2 adjustable shelves, wardrobe bar for hanging clothing and 3 drawers; cherry, maple and walnut wood furniture. 3 pull-out drawers and 2 cabinet doors. 65'H x 41'W x 24'D. 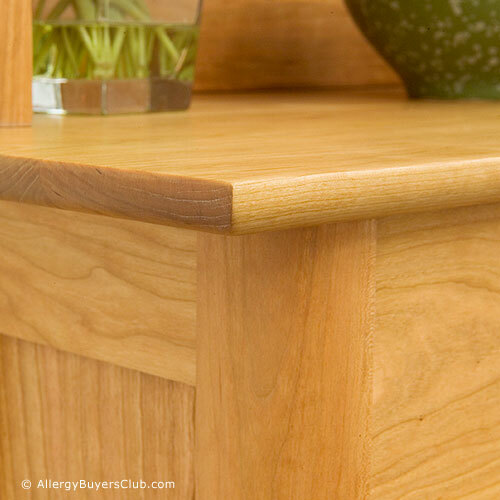 High quality, solid cherry, maple or walnut hardwood. Hand-rubbed with linseed oil finish. Chatham Armoires by New England Wood add a sense of grandeur to your bedroom furniture set that only well-made furniture can. Inspired by the American Craftsman movement of the early twentieth century, these wood armoires with contemporary styling are enhanced by the heavily rounded leg edge and elegant rounding of the undersides of top surfaces. Hours of careful hand crafting, hand sanding and the hand-rubbed oil finishing go into creating these armoires with classic beauty you will enjoy for years. Even the wood is hand selected to match grains with special attention to quality control so you get only the best solidly made wooden furniture. These roomy 65" and 78" wardrobe storage armoires in solid cherry, maple or walnut wood will expand your closet so you have easy access to your clothing and bed linens. Style: Legs and the undersides of top surfaces have rounded lines for a solid, yet elegant appearance that is complimented with an Art Deco influence. Complete instructions along with ongoing care are provided with the furniture at time of purchase. It is suggested that you avoid tung oil and do not use furniture polish, dusting sprays that include a polish, or any wax. 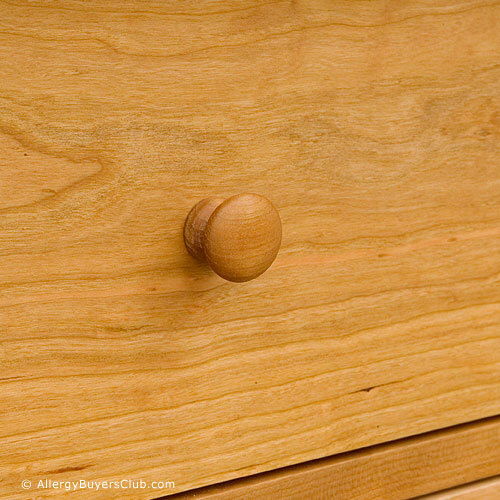 Shortly after the armoire is placed in your home, re-oiling is recommended, and periodically after that. These bedroom armoires are securely joined together with mortise and tenon joints to gain the superior strength and flexibility of movement allowed when one block of wood is inserted into another. 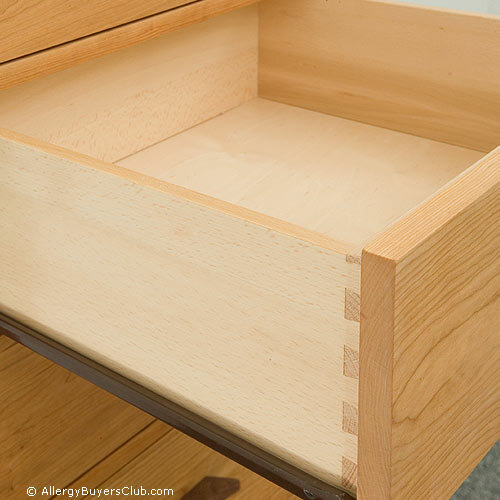 Traditional solid wood drawers, dovetail construction and smooth steel glides for durability is a choice that will result in the most durable, long-lasting furniture. I loved that the furniture came with white glove delivery service and was delivered without a scratch. Awesome! Every time I walk into my office and see this furniture I think how beautiful it is and it is satisfying in this day and age to find furniture which has been so lovingly handcrafted, which manifests itself in how the drawers just glide out. The furniture collection in my office is sufficiently attractive that it routinely draws comments of admiration from visitors to our home. There is nothing utilitarian about this line of furniture although the designs are very functional. Yes, as I mentioned this is not cheap particle board furniture, it is agelessly furniture that you can pass down the generations if you so choose. In the meantime, you can treat yourself to this gorgeous furniture in your home. Each piece is made to order so do not be in a hurry as this manufacturer is always late in delivery- but the wait is oh so worth it!